The top leaders have an ambitious imagination to conceive of serving an exponentially bigger market by becoming a digital enterprise. Make no mistake that in the near future every successful company will be digitised. They will be "math houses" that have at their core the use of algorithms, sensors and sophisticated software. Leaders have to go on the offense by imagining how to use new technologies and mathematical capabilities to create a market space that is ten or even a hundred times larger. That's what the likes of Netflix, Google and Amazon have done. Leadership is no longer a matter of sensing secular, seasonal or cyclical changes and anticipating bends in the road. - A mindset focused on the "end-to-end customer experience" permeates the company. Everyone in the enterprise strives to deliver an experience that is more convenient, cheaper, faster, less time consuming and more pleasurable. This may require a wholesale change in coaching and training and perhaps the replacement of some people who cannot adapt. A top team that sticks too long with the old mindset is at high risk, given the speed with which destruction can come full force. - The essence of the strategy is a platform, as at Amazon, Alibaba, Google and GE digital, with algorithms at its center. The design of its software, data structure and algorithms can capture and customise consumer experience in nanoseconds. The platform is flexible and provides countless options for the company and perhaps others to build on it. It can be modular and can incorporate artificial intelligence. Core competence in designing and operating the platform makes it possible to solve hitherto unsolvable problems and creates extraordinarily large opportunities that can be converted into customer benefits and profits. - The top leaders have an ambitious imagination to conceive of serving an exponentially bigger market by becoming a digital enterprise. They recognise that problems that were too big to crack in the past can now be solved precisely because of digitisation, algorithms and sensors. Witness the reality of the driverless car, which not long ago was mere fantasy. - The aim is to treat each customer as an individual. This can be achieved only when the organisation is unshackled from the industrial hierarchical structures that were created long before the advent of digital technology and information transparency. These structures have outlived their usefulness and are now a competitive disadvantage. Layers of decision making create ginformation filters h that distort consumer feedback. They make the enterprise slower and less responsive and therefore vulnerable to digital startups. - Innovation and experimentation are continuous as the enterprise seeks new offerings the customer will find compelling. Generating new ideas must be part of the company fs DNA in order to keep pace with changes in consumer behaviour. Algorithms allow the testing of ideas with statistical validity at low cost and high speed. - Millennials are integrated into the organisation, and new organisation structures and coordination mechanisms replace industrial hierarchical layers. The organisation is project based, and has fewer layers (a maximum of three, regardless of number of employees). 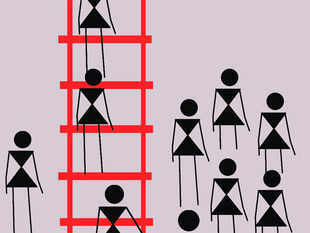 Senior people must come to grips with the presence of this new generation, who seek substantive growth on meaningful projects and are unwilling to move up slowly through a dozen organisational layers. - The ecosystem is reshaped and managed via digitisation. It adapts quickly to external change. Some players may have to be eliminated and new relationships formed. - A new breed of leader arises with skills in linking the customer experience and a digital algorithmic platform. Digital natives such as Jeff Bezos of Amazon and Sergey Brin and Eric Schmidt of Google grew up that way, but others can learn. It is a mandatory skill at the very top.